Click FILTER button on the toolbar or "Tools -> Filter" in the Main menu. In the column you want to filter type the name of a particular assignment (i.e., the condition) you want filtered. When you want to perform more complex filtering type filter criterias in several columns. In the appeared dialog click "Yes" Button. You can also remove the filter from your Table by clicking FILTER button on the toolbar . We develop application software using any kind of DBF format file. 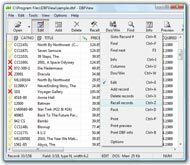 The DBF files generated (FoxPro DBFCDX in windows format) are different from the equivalent FoxPro generated in DOS format: as a result of that the utilities I use to maintain the DBF files (mainly DBU of Clipper) are enable to manage all formats. I should have at least 3 versions of the same utility. For this matter I started a research on the web to find a more rational tool. I've downloaded several DBF managers very good products but they don't solve the compatibility problem. Only DBFView has the main feature I'm searching for : it recognizes the DBF format! And then the graphical interface of DBFView is very user friendly, agreeable to see, and the exe is very small.